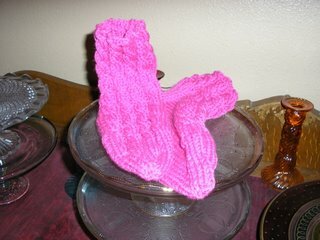 Knitting Relaxes Me: Are you tired of the Cable Footies yet? Look, it's a pair of hot pink cable footies at home among the cake stands! This is my second pair of these, and they're great - a very quick knit, even if you frog half of the first one you knit (which I did, both times). They're from One Skein, and knit in my fave Cascade 220. I used US8 BrySpun Bry-Flexes, which I've already gushed about. These are for my friend Linne', who I'll be rooming with at MLA. Last time I mentioned our yarn swap on Saturday at Valletta Kafe in Pleasanton. We all had so much fun, and luckily Susan has posted pictures. Be sure to check out Enid channeling Frida! And that's not some sort of dead animal on her head - it's a large skein of something (mohair boucle?) that Kim got from Betsy, owner of the really charming Kafe. And summer is here with a vengeance. Although the official temperature today was only 99, it was 102 on my side of town. The normal high is around 80. Just a touch of global warming, maybe?